I’m back. I take a break but I always come back. I miss my blog and my readers, so here I am. You are probably wondering why I take breaks. That’s a hard question to answer since I do enjoy it so much but it mostly is a time issue. It takes me a long time to create the posts especially when I have to Photoshop all of my wrinkles and messy house out of my pictures (ha!) but even beyond that it does take a while to gather the pictures and get them ready for the blog. It’s really no other reason than that. 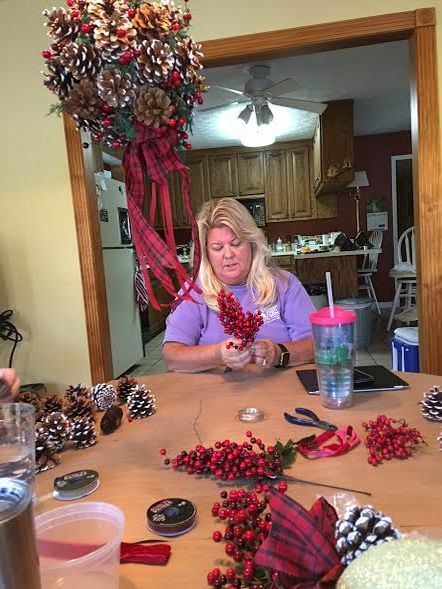 Things have slowed down a little bit since school started in August and I will soon have Thanksgiving and Christmas vacations to blog to my heart’s content, so….I’m back. I do love a good Crafty Weekend with some girl pals. In this most recent one we decided to bring only one craft each and everyone outdid themselves. I will present them in the order that we made them along with a recipe craft at the end. Here we go. 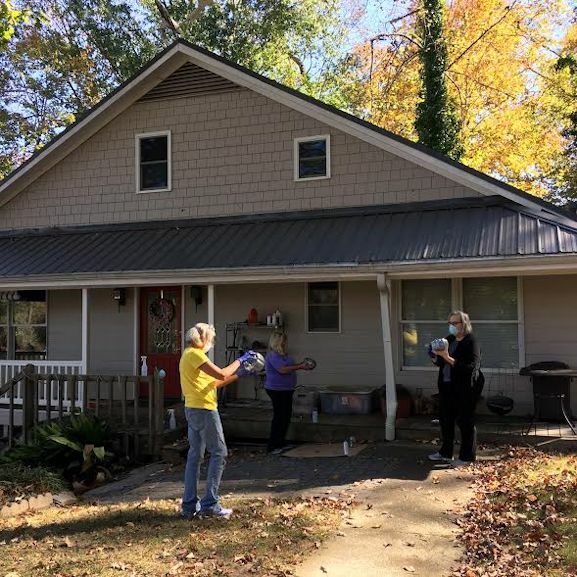 We met at my friend Terri’s house on Lake Jackson. The view from the porch is always beautiful. 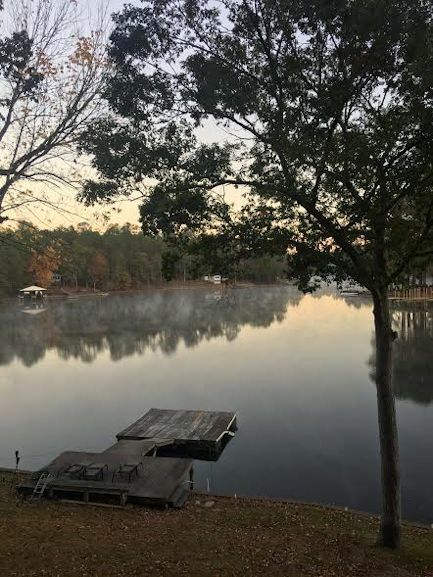 I was up first (big surprise) and captured this image as a bit of fog was misting over the water. 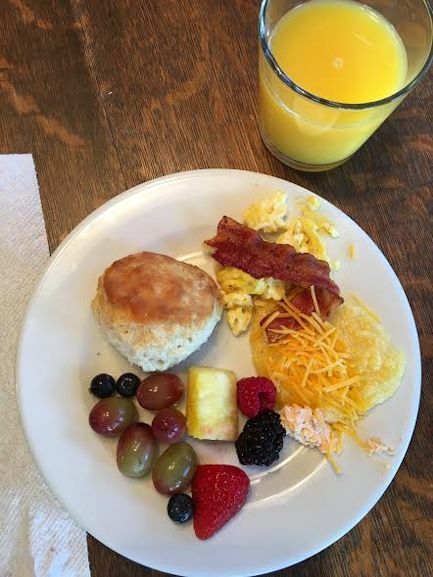 Terri got up next and fixed us a big breakfast of eggs, bacon, grits, biscuits, and fresh fruit. I love a good breakfast. 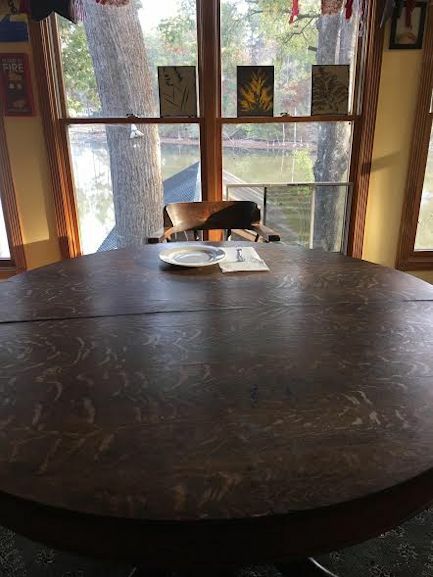 That fondness started years ago when I lived in a sorority at the University of Georgia and we had a breakfast buffet every single morning! I first learned to love grits at the Chi Omega house at UGA. 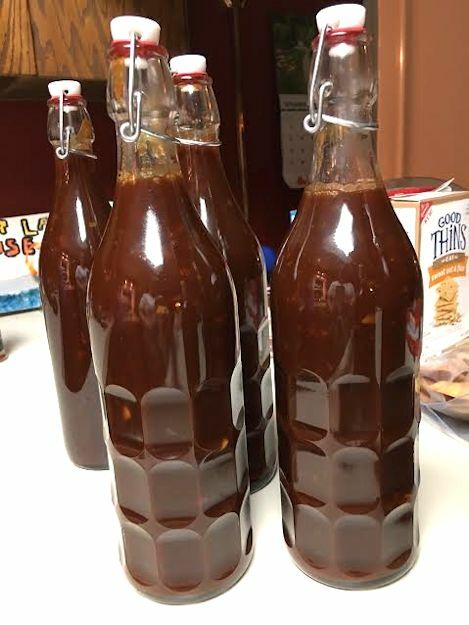 Before we got into the regular crafts, Gina started us off with a food craft and made her Jack Daniels BBQ sauce. 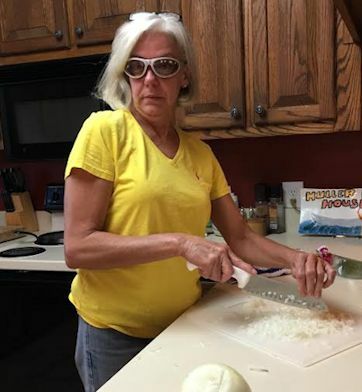 The onions were pungent and Terri saved the day with her Grillin’ Goggles. The BBQ sauce aroma was amazing as it simmered all afternoon. Even better was the fact that each person got to take home a jar. We ate it that evening with Steve T’s famous smoked pork. We had some good meals, for sure! 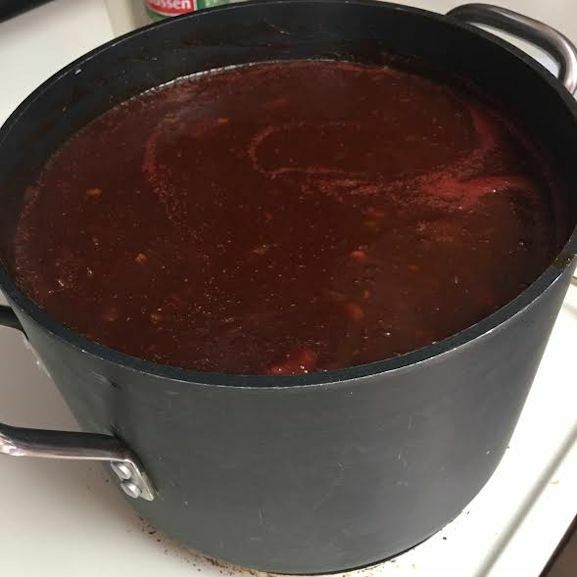 Recipe for the sauce is at the end of this post. 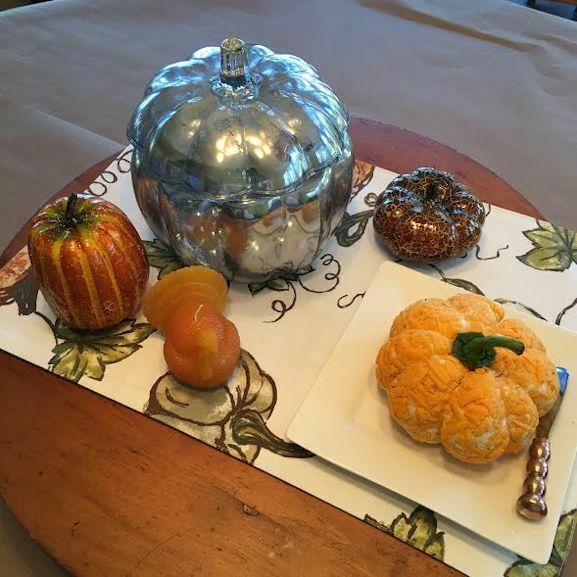 For the first craft I brought materials to make a faux Mercury Glass Pumpkin. We used clear glass pumpkins and we spritzed the inside with water and then sprayed the inside with mirror silver spray paint. After the paint dried we put fairy lights in for a soft glow. It was super easy but very stinky. We ended up using masks and gloves. I highly recommend them for everyone trying this craft. I called this craft the Harvest Cheese Vignette. (I do love to name things!) 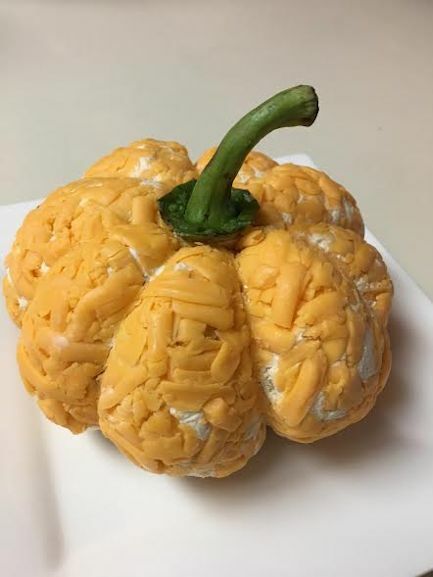 The cheese ball was easy to make into the pumpkin shape. You make a cheeseball (this was 2 blocks of cream cheese and a Knorr dry vegetable soup package) and then roll it into freshly shredded cheddar cheese. 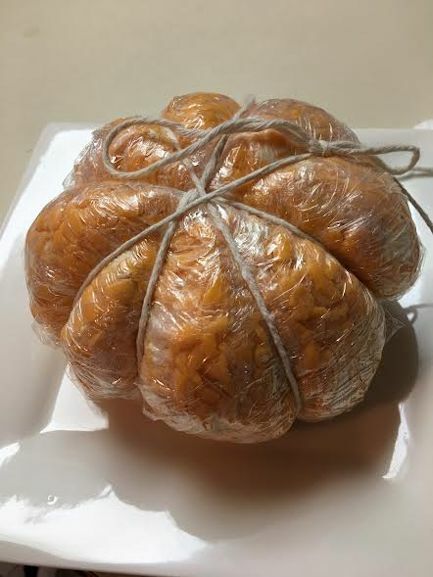 Wrap the cheese ball in plastic wrap and tie twine around it in four places. Refrigerate for one hour. Remove from the plastic wrap and place the stem of a green pepper on the top. We had to sample the cheese and then decided to bust out the other snacks. 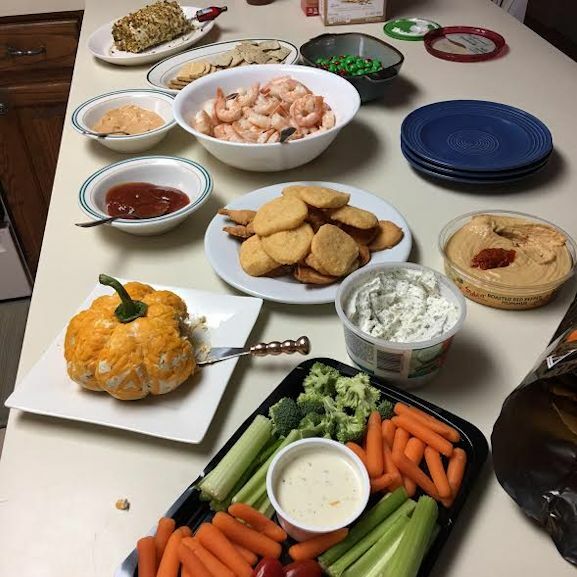 It was quite a spread. 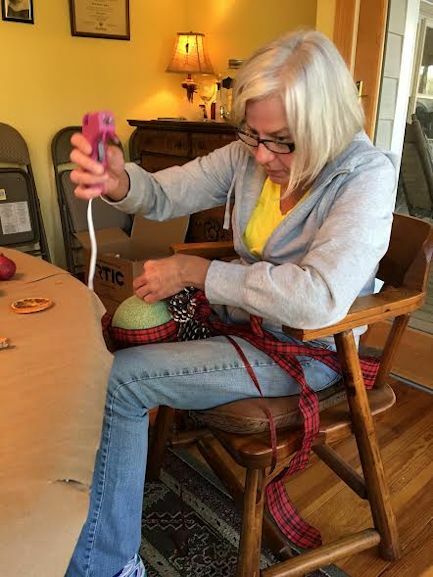 Moving on to craft number two from Terri. 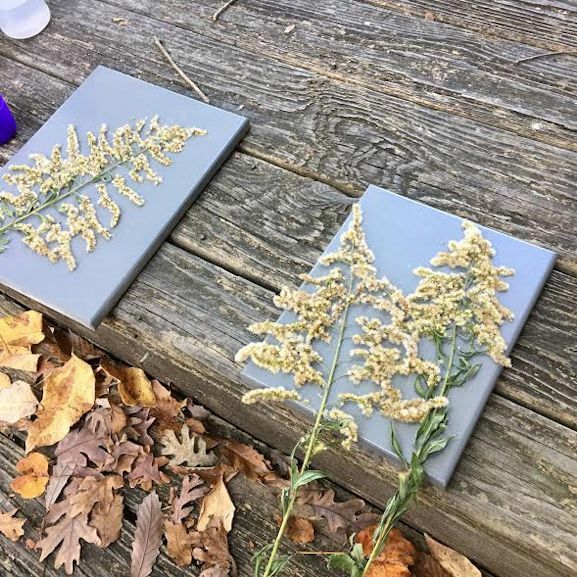 We made nature prints on canvas. First, spray paint a small painting canvas. Next, spray flowers or greenery with adhesive spray. Arrange the flowers on the canvas and then spray the canvas again with a contrasting color. The results were very pretty and each was different. 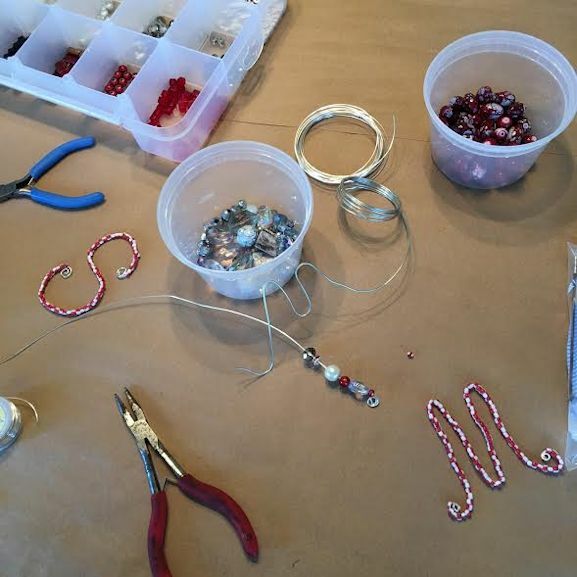 Diane led us in making beaded Christmas ornaments. I made an ‘M’, an icicle, and then I made Terri a keychain which I know she will treasure forever. We worked into the early evening with our last craft of the day – a kissing ball. 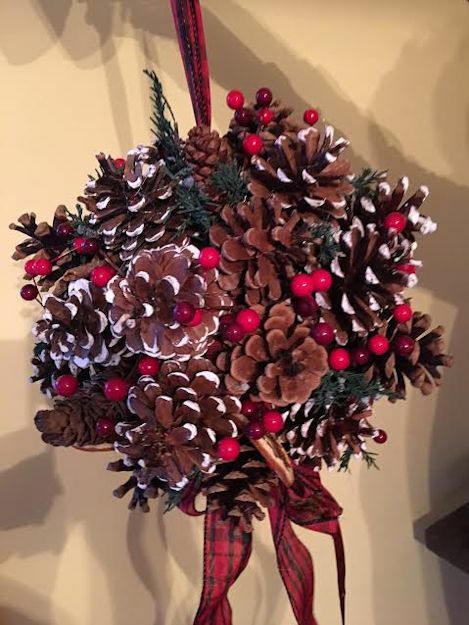 Gina brought foam balls, wired ribbon, thin ribbon, and bags of potpourri with pinecones, cinnamon sticks, and orange slices. 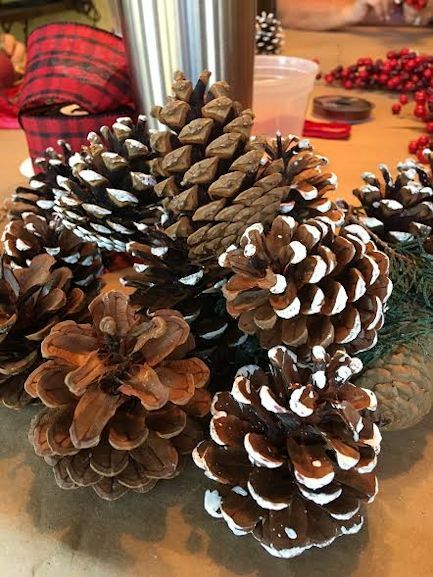 We used hot glue to attach the dried plants and cones to the foam ball. This was serious business! 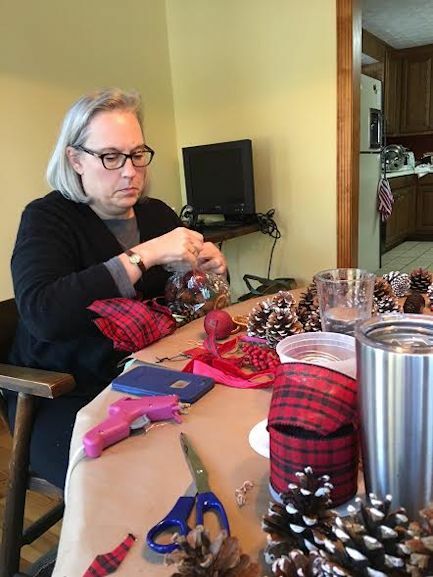 Terri is eyeing me to make sure I don’t steal her pinecones or perhaps she is plotting to steal mine. Here is my finished product in the shadows of the evening. We then ate dinner, watched a little TV and gained an extra hour of sleep from the time change. My sleep was also enhanced by Terri’s blackout curtains. I do not have those on my windows at home and I really think I sleep better in a dark room. Something to consider when I get the next coupon from Bed Bath and Beyond. The next morning we were up pretty dang early because of the aforementioned time change. Well, almost all of us were up pretty early…. 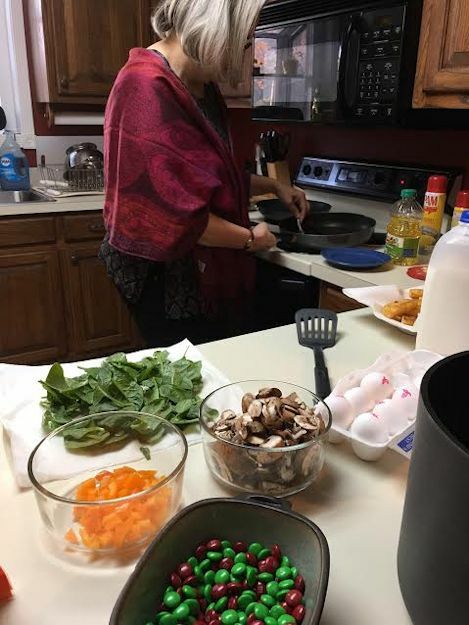 Ya gotta love a breakfast omelet bar with M&M’s on it! Hmmm…do I want M&M’s or fungus, I mean mushrooms???? We left after breakfast and I brought my goodies home. 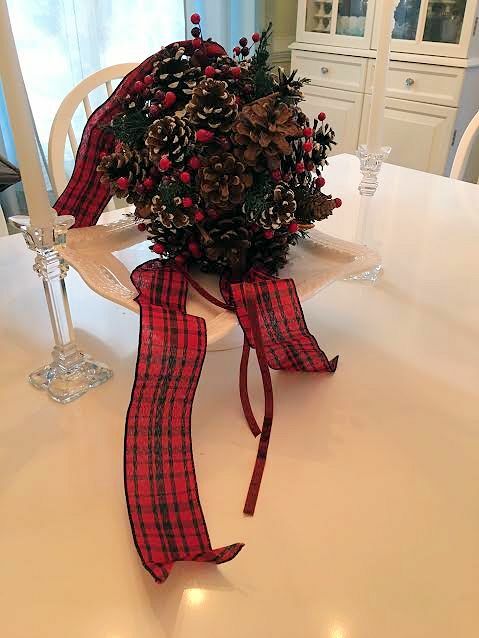 I plopped my kissing ball on my dining room table on one of my pedestal cake stands. Love it! It will stay there for a while until I find the optimal kissing doorway or a frame to fit over my head so that I will be an obvious target for some handsome fella other than Chupa! 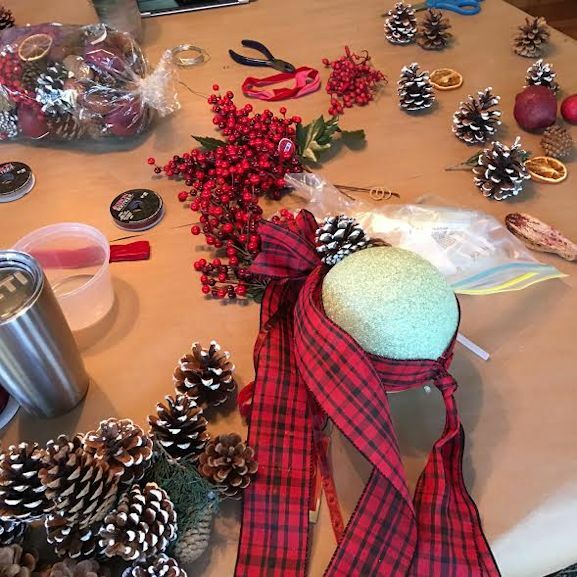 Love the kissing ball, and in fact, I love all the crafts. I can’t wait for the next Crafting Weekend. Hope it comes along soon! Join me sometime! I am always up for snacks, crafts, and of course, the friendship that comes along with the shared experience. Finally, I leave you with the BBQ sauce recipe. 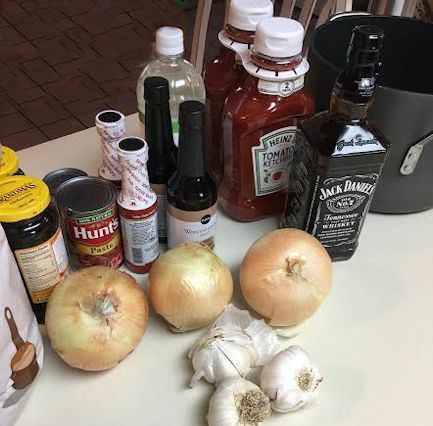 Now, everyone knows I am not a drinker but as you make this sauce with the Jack Daniels the alcohol is completely burned off in the cooking or in the lighting stage, so it is safe for the kiddies to eat and tasty for the teatotalers like me who never drink anything stronger than Ginger Ale. Combine onion, garlic, and Jack Daniel's in a sauce pan. Sauté until onion and garlic are translucent, approximately 10 minutes. Remove from heat and light mixture, let it flame for about 20 seconds. Add all remaining ingredients. Bring to a boil, then turn down to a medium simmer. Cook for 20 minutes, stirring constantly. Remove from heat and let cool. Combine onion, garlic, and Jack Daniel’s in a sauce pan. Sauté until onion and garlic are translucent, approximately 10 minutes. Remove from heat and light mixture, let it flame for about 20 seconds. Add all remaining ingredients. Bring to a boil, then turn down to a medium simmer. Cook for 20 minutes, stirring constantly. Remove from heat and let cool. Welcome back Julie! Another fun and interesting blog. Thanks! And a big thanks for hosting us for the weekend.